For Diógenes Ballester, one function of the artist, like that of the arteologist, is to discover, investigate, extrapolate meaning, and offer a reconfigured perspective on what has been left behind as artifacts. He has been blessed as a Puerto Rican with a rich religious, cultural, political, and familial heritage, which coupled with personal experiences, invites curiosity and investigation. These are the factors that interest him and through which he express his creativity. These are the memories embedded in his installations. This is the life energy manifested in the archeological artifacts, historical documents, and found objects. Taken together these apprehended, reconfigured, and re-contextualized components become altar like pieces that depict layers of history and culture. In these installations, he explore oral history, memory, mythology, ritual, and cultural identity along a transnational spectrum. I have appropriated cultural objects and historical artifacts together with painting, drawing, prints and new media as a way of accessing the past and re-interpreting the present in a trans-Caribbean dialogue. The Crying of the Earth, 2010. Installation View. Encaustic painting on linen, sculptures and organic material. 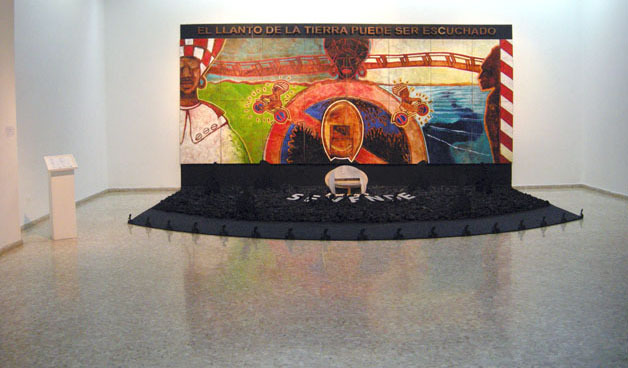 Presented at the First International Triennial of the Caribbean, Museum of Modern Art, Santo Domingo, Dominican Republic. 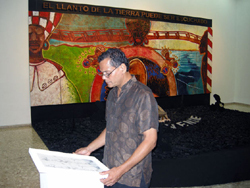 Photo of the artist participating in his installation entitled The Crying of the Earth, 2010 at the First International Triennial of the Caribbean, Museum of Modern Art, Santo Domingo, Dominican Republic, 2010.